Between 1814-17 John Constable decided to paint modest sized and carefully executed paintings in the open air, to improve his powers of finishing. This painting, which was attributed to Constable only in 2004, contributes to our understanding of that initiative, which has long been regarded as of major importance in the emerging story of naturalism in Western landscape painting. Constable is thought to be one of the very few European artists who painted finished pictures, rather than just small landscape sketches, in the open air with any regularity until the Impressionists, some fifty years later. 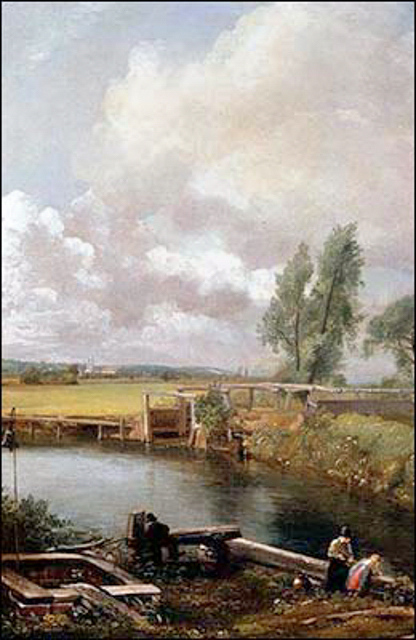 The painting is a unique image in Constable's work which records important features of the local landscape and the workings of the lock at Flatford, which are documented in no other work by the artist. Constable also records the exact workings of the Stour, with its sluices, lock chambers and lock mechanisms. The structure with a bell, in the left foreground, is thought to be an automatically operated warning device relating to the height of the water below the mill. The painting measures 61 x 50.8 cm. Discussions about its sale had a price tag of £2,788,003 plus VAT in May 2007. You cannot reproduce this view today due to the trees, the mill house is to the east of the mill and you can only just see the mill from the lock today, so from the mill house you would see just woodland. We know from the bell mechanism that its the downstream end of the lock. The position of Dedham church to the left of the centre of the picture lines up if mill house is the part I think of as the mill, so the building you can see in the photo below. This is the area from the opposite side of the river to the painting, and you can see the mill in the background, mill house is to the left of this. These two images are amongst many I have of this end of the lock, and I can't see any remains of the bell mechanism, but it might be in the woodland.